I remember when I had my first and only full facial breakout, I thought it was the end of the world. OH Hell no.... someone call Ghostbusters... well in my case the PIMPLE TERMINATORS! I thought it was the end of the world and my face was going to look bumpy forever. SIGH! I was ready to spend my whole paycheck on a dermatologist that would clear it up, but luckily for me, I kept my money in my pocket and invested a little in some skincare products. Not only was I able to clear my skin but I was able to get rid of the pimples and some of the acne marks. I was determined! I didn't have to buy anything out of the ordinary, I simply stuck to a routine. Once I got over the shock of the breakout I jump right into a routine that would help me clear my face and minimize the size of the pimple which would eventually make it disappear. One thing was certain, Even though I started wearing a lot of makeup, probably more than Marilyn Manson, I knew to improve my skin condition I had to remove my make up every night so my skin could breath and use the right products that would work best for my skin type. I started doing the same routine over and over again and before I knew it my face started to look normal again. Overtime the pimples disappeared and the scar marks started to fade and lighten up. After my pimples cleared, then I was able to include other routines to get rid of the scars, brighten and others we would talk about in weeks to come. 1- You must NEVER EVER EVER sleep with makeup on! 2- You have to follow the routine every night. NO days OFF! If you agree to this... then lets keep going! The routine was/is still simple. Product: Simple Skincare cleansing face wipes. I use the face wipes to gently removes makeup, mascara and all other things I put on my face. This cleanses and refreshes my face and prepares it for the next few steps. It's really easy to use. Open the seal, pull out one sheet of the wipe and wipe it over eyelids, eye lashed, face and neck to get the makeup off. Get another wipe and run it over again. You can immediately see your makeup coming off on the wipes. once your done, toss the wipe in the trash and move on to step 2. I use this gentle exfoliant to extracts oil and debris from my pores and kills bacteria buildup that causes pimples. It is great for problem skin as it has helped with calming, healing and clearing my skins appearance. To use this product, I simply pour some in my hands, lather it up, and start to cleanse my face in a circular motion, while massaging it into the skin. I do this for about a min or two, wait 15 seconds before rinsing it off and move on to step 3. This scrub has really helped to improve my skin tone and the texture. The micro beads help to exfoliate the dead/dry skin which helped my skin to look clearer over time. To use it, I put some of it on my finger tips, and start rubbing it into my face and neck making sure to go over the outer part of my face, where I am prone to breaking out. Massage into face for 2 min, wait 15 seconds for it to soak, and then rinse your face. take a towel, gently pat dry and move on to step 4. Toner is a must in a good skincare routine. It’s main functions are to close my pores, remove the last traces of dirt and oil in my skin, and re-balance skin’s pH after all the cleansing & exfoliating. I love this toner from Mario Badescu! It's really refreshing and helps with hyper-pigmentation and discoloration on my face. I use this two times a day, during my morning & evening face wash routine. I pour some on a cotton pad and wipe my face in an outward direction, until the cotton pad shows no trace of dirt on it. Once done, I know my face is super clean and then I move to step 5. While I was trying to get rid of the acne, I was using two serums, not together on the same day but every other day will switch up. I wanted to get rid of the acne and also wanted to brighten my face at the same damn time! I wasn't sure if my skin was going to react to it, but I was willing to take the high road and try it, and it worked perfectly for me. On Monday, Tuesday, Thursday and Saturday, I would use the Anti-Acne Serum and then use the Vitamin C Serum on Wednesday, Friday, Sunday. The Anti-Acne serum really helped with minimizing my pimples and clearing my skin. I noticed my breakout reduced a whole lot and my face started looking clearer. 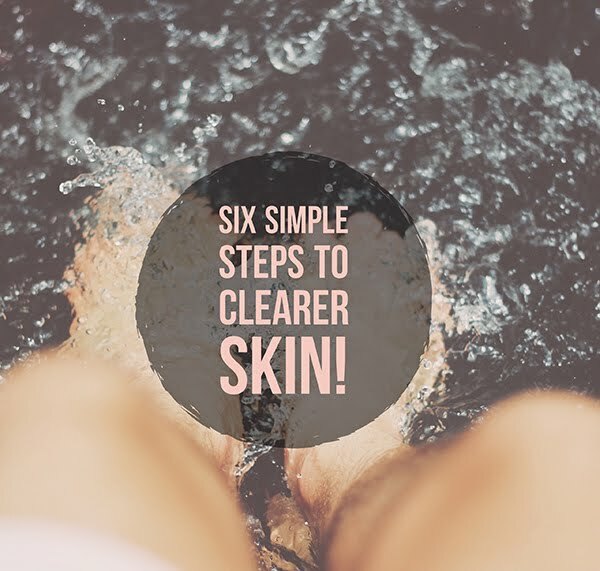 Using it was easy, I focused on my acne prone areas, rub a thin layer on my clean skin and wait for it to absorb before moving to step 6. As for the Vitamin C serum, It is FABULOUSNESS! in a bottle. It reduced discoloration, retained moisture in my skin, making it look brighter, fuller and firmer. I would take 5 drops on my hand, rub them together and start pressing it into my face and neck. Once my acne cleared, I stopped using the Anti-Acne Serum and just stuck to using the Vitamin C serum. I love the glow I get the following day. So now, step 6. Sunscreen SPF 30, lightweight. Day time wear. I was given this product at an event in the city and after I read the ingredients and saw that it had SPF 30 in it, I was eager to try it. I use the moisturizer to hydrate my skin because I have really dry skin. I like the way it's soft and really sinks into your skin. Also under makeup, it gives me that nice dewy look. LAV IT! When getting rid of acne and the marks I have to use sunscreen so the spots don't get darker, especially after all the products I put on your face. The hydration lasts all day and after a few weeks I started noticing the softness in my skin texture. I put two pumps in my hands, rub and massage it into my face. I always use it 15 minutes before I go out in the sun, just like I would any other sunscreen. Although I did this routine during winter time, all natural coconut oil was the way to go. All I would use is a scoop with one finger, rub it together and massage into my face. Coconut oil has properties that fights bacteria that causes acne.This really helped with hydration and really helped in getting rid of acne. I started seeing major result in week 1, and by the end of the second month all the acne was gone and the black spots started to fade. I still use the same routine and just add other products on specific days now, like a face mask, etc. This routine has really worked for me and I highly recommend it to anyone who suffers from acne breakouts. I made a picture you can save it, print it, pin it and share it to always remind everyone reading this of the simple steps to take to clear your skin. I hope it helps! So beautiful people, what steps have you taken to getting clearer skin? Share it with us! Good read! I use the Mario B Vit C serum and I love it too. One thing I did to clear my skin was a few chemical peels. i like this blog!